The hospital building at Tarancón. As part of the events surrounding the 75th anniversary of the founding of the International Brigade, a group of Lincoln vet family members took a tour of some of the central sites of the US Medical Services in the Spanish Civil War. The tour, led by Alan Warren, visited several hospitals directed by Dr. Edward Barsky–including one housed in a small building in Tarancón that is scheduled to be torn down. 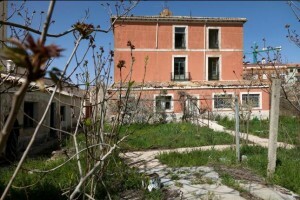 Community activists are involved in a preservation effort, hoping to designate it as a site of memory; they have received widespread support from scholars and organizations in Spain and abroad, including ALBA. During the recent visit, a local videographer interviewed Georgia Wever, John Kailin, and Nancy Wallach; see the interview here.